Mark Anthony Neal is a Professor of African and African-American Studies and Director of the Center for the Arts, Digital Culture and Entrepreneurship (CADCE) at Duke University. Neal also hosts the weekly video webcast Left of Black, and is founder and managing editor of the blog NewBlackMan (in Exile). You can follow him on Twitter @NewBlackMan. Deeply personal, wickedly insightful, and politically transformative, New Black Man is a must-read on black men and feminism in the 21st century. Neal demonstrates yet again why he is one of the leading scholar-activists of our time. Mark Anthony Neal is just about as dope as dope can get. In New Black Man, he provided the blueprint for a new generation of black men to do the work of interrogating masculinity, and a decade later it is still the definitive black male feminist text. It's a classic in every sense of the word. Mark Anthony Neal’s critique of old modes of discussing black masculinity is eloquent. Indeed, his analysis of the "the strong black man" and the risks that idea poses to black liberation is long overdue. Engaging, thoughtful, and soulful, this important book is part cultural criticism and part blueprint for a new version of black masculinity (without homophobia and misogyny). I, for one, welcome the arrival onto the scene of the "new black man." You need oxygen to breathe more than the fetid air of homophobia, misogyny, antiblack racism in the empire and its possessions. 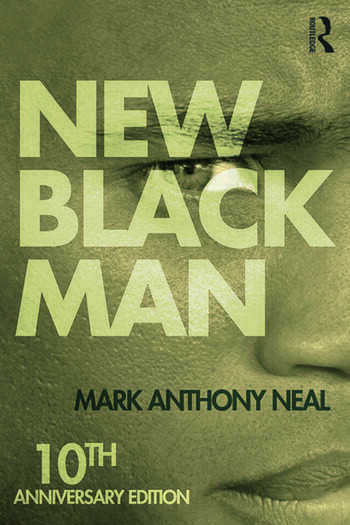 Read Mark Anthony Neal’s New Black Man. Here, Neal redefines the "burden" and expands the struggle for a society free of denigration and violence. Mark Anthony Neal has always been a daring scholar, but in this work he does pirouettes on a razor’s edge, deliberately and deftly defying the keepers of the weary worn "race man" trope and all its essentialist trappings. Mark Anthony Neal’s New Black Man is a fascinating exploration of an important scholar’s acknowledgement of black feminism as a central mode of cultural investigation and a mode of humane existence. Part academic treatise, part soul-baring memoir, New Black Man is the unlikely offspring of hip-hop and feminism. … Neal offers a call to action by challenging not only the conventional white powers that be, but also the black men who sanction inequality by upholding patriarchy and heterosexism. Far from being a dull polemic, Neal's new work is sharp, provocative, and often laugh-out-loud funny in the manner of Michael Eric Dyson and Ishmael Reed (caveat: Neal's language can be rough). … [T]his book is a clarion call that should be read by the entire African American community. Mark Anthony Neal’s New Black Man is an exploration of modern black masculinity put into conversation with progressive ideas of feminism, fatherhood, and antihomophobia. … For readers whose knowledge of African American feminism begins with Sojourner Truth and ends with bell hooks, the breadth of Neal’s scholarship will prove very useful. Throughout New Black Man, Neal's prose drifts interestingly from traditional professor to accessible hip-hop language. Neal presents a very interesting combination of the complexity that is the New Black Man. In a gripping "tell it like it is" style, Neal advocates a different role model—the "New Black Man"—and promotes a theoretical alliance with black feminism. … New Black Man will be an asset to many undergraduate and graduate courses.